Two new photos of David Tennant with fans have been posted to Instagram here and here. Broadchurch Season Two premieres on RTL 4 in The Netherlands tonight at 8pm. David Tennant Daily News Digest for Friday 29th and Saturday 30th May 2015 (12 items). Single Father will now no longer be broadcast tonight on UK television. The first repeat on UK television of Single Father (5 years after its initial broadcast) is on True Entertainment tonight at 9pm. Broadchurch Season Two starts broadcast tonight in Slovenia on the station SLO 2. SierienJunkies has reported that Broadchurch Season Two will not air in Germany until Spring 2016. The Real History Of Science Fiction to be broadcast in Japan in the early hours of Friday 26 June. The release of What We Did On Our Holiday in The Netherlands has been brought forward by two weeks from 16th to 2nd July. The US trailer for What We Did On Our Holiday has been posted to YouTube. David Tennant Daily News Digest for Thursday 28th May 2015 (5 items). David Tennant to guest star as an evil genie in Captain Jake And The Never Land Pirates as part of Disney Junior's Soaring Over Summer television event. David Tennant Daily News Digest for Wednesday 27th May 2015 (5 items). Broadchurch Series Two to be broadcast in Japan on Sunday 19th July. All eight episodes will be shown that day on the station WOWOW. Episode nine of Gracepoint has its UK premiere tonight on ITV Encore at 10pm. David Tennant Daily News Digest for Tuesday 26th May 2015 (5 items). The release date of the Broadchurch combined Season One and Two DVD and Blu-ray in France has been brought forward by 10 days to Monday 5th October. The David Tennant / Olivia Colman interview on The Graham Norton Show (which was broadcast in the UK on 16th January 2015) will be shown on BBC Australia tonight at 8.30pm. Gracepoint starts broadcast in Germany on Sky Atlantic tonight. David Tennant Daily News Digest for Monday 25th May 2015 (3 items). RTL 8 in The Netherlands broadcasts two episodes from the original Broadchurch series every night at 8.30pm from tonight in order for viewers who missed the first season to continue watching Season Two from 31st May. David Tennant Daily News Digest for Sunday 24th May 2015 (4 items). A photo of David Tennant with a fan and her artwork has been posted to Instagram. Titan Comics have released the Tenth Doctor variant art for the Doctor Who Comic cross-over comics this summer. David Tennant Daily News Digest for Saturday 23rd May 2015 (4 items). Ellis Parrinder has posted some new photos of David Tennant to Instagram to announce his new photography website. Kasterborous reviewers look at their favourite Doctor Who Series Four episode and has a poll to vote. David Tennant Daily News Digest for Friday 22nd May 2015 (4 items). Two new photos of David Tennant from A.K.A. Jessica Jones filming have been added to VK.com. There is a rare repeat of Spies Of Warsaw on UK television in June. David Tennant Daily News Digest for Thursday 21st May 2015 (5 items). Issue #4 of Doctor Who Comic is available in the UK. Poster for What We Did On Our Holiday US release. Broadchurch original series is released in Germany on DVD and Blu-ray today. David Tennant Daily News Digest for Wednesday 20th May 2015 (5 items). The Broadchurch Effect documentary (with Chris Chibnall interview) has been posted to Vimeo. In it Chris says that Series Three of Broadchurch was commissioned at the same time as Series Two and that Broadchurch was always planned to be a three story trilogy. Doctor Who: The Daleks DVD will be released in the US in July. It features the two David Tennant / Tenth Doctor episodes The Stolen Earth and Journey's End from Season Four. Episode eight of Gracepoint has its UK premiere on ITV Encore at 10pm tonight. David Tennant Daily News Digest for Tuesday 19th May 2015 (6 items). Dixon Of Dock Green radio drama (staring David Tennant) to be released on CD on Thursday 3rd December. This round of the awards is open until midnight on Friday 5th June. Doctor Who: The Cybermen DVD is released today in the US. The first repeat on UK television of Single Father (5 years after its initial broadcast) will be on True Entertainment on Saturday 30th May. David Tennant Daily News Digest for Monday 18th May 2015 (5 items). The Real History Of Science Fiction airs on ZDF Info in Germany. All four episodes will be broadcast this evening. W1A Series One and Two are released on DVD today in the UK, Australia and New Zealand. United is released on Blu-ray in the UK today. David Tennant Daily News Digest for Saturday 16th and Sunday 17th May 2015 (6 items). Broadchurch original series concludes its broadcast tonight in Germany on ZDF. Episodes seven and eight will be shown. It was 4 years ago tonight David Tennant and Catherine Tate played their first performance of Much Ado About Nothing! David Tennant Daily News Digest for Friday 15th May 2015 (6 items). The Scotsman has more details about David Tennant's new movie Metanoia. Episode one of the second series of W1A is on BBC Canada tonight. David Tennant will star in the movie Metanoia. Shooting is expected to take place in the first quarter of 2016 in Cologne and on location in London. Doctor Who starts broadcast in India today. The run will include all of David Tennant's episodes. David Tennant Daily News Digest for Thursday 14th May 2015 (6 items). A Doctor Who Trailer for Disney XD (featuring David Tennant) has been posted to YouTube. The BBC have posted a video looking at 10 years of Doctor Who since its regeneration in 2005 to YouTube. Episode four of the second series of W1A premieres on BBC Two tonight at 10pm. What We Did On Our Holiday is released in Korea today where it is called Happy Holiday. David Tennant Daily News Digest for Wednesday 13th May 2015 (7 items). Doctor Who: New Adventures With The Tenth Doctor Issue #10 is released today. Broadchurch Season Two premieres on RTL 4 in The Netherlands on Sunday 31st May. Also, starting on Monday 25th May, RTL 8 will broadcast two episodes from the original Broadchurch series every night at 8.30pm in order for viewers who missed the first season to continue watching Season Two from 31st May. Marvel's A.K.A. Jessica Jones behind-the-scenes hardback book available to pre-order in both the US and UK. Episode seven of Gracepoint has its UK premiere on ITV Encore tonight at 10pm. David Tennant Daily News Digest for Tuesday 12th May 2015 (4 items). The Doctor Who Comics Summer crossover art work has been revealed by MTV News. KSiteTV have posted a fun video of David Tennant and Olivia Colman recording Broadchurch promos from the Season Two DVD extras. 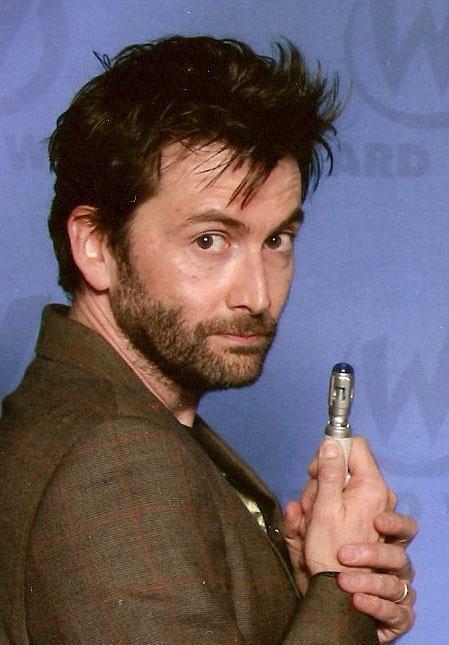 David Tennant Daily News Digest for Monday 11th May 2015 (7 items). Yahoo! has an article (with a video from the Season Two DVD extras) about the great chemistry David Tennant and Olivia Colman share in Broadchurch. The Real History Of Science Fiction will air on ZDF Info in Germany on Monday 18th May. All four episodes will be broadcast in the one evening. ZDF have posted a trailer for the Broadchurch Season One finale which airs in Germany on Sunday. David Tennant filmed a fun video response to Matt Smith, Freema Agyeman and Alex Kingston at Wizard World Comic Con Philadelphia yesterday. A video of the full David Tennant / Billie Piper panel on Saturday at Wizard World Comic Con Philadelphia has been posted to YouTube. Jessica Hynes won the Best Female Performance In A Comedy Award at BAFTA last night for W1A. During the BAFTA ceremony a short clip of Broadchurch was shown in a montage of some of the greatest television moments of the past year. David Tennant Daily News Digest for Sunday 10th May 2015 (7 items). David Tennant and Billie Piper video to Matt Smith from their Comic Cons. Photos of David Tennant with fans at Wizard World Comic Con Philadelphia today. Video clips of the David Tennant and Billie Piper from panel yesterday at Wizard World Comic Con Philadelphia have been added to YouTube. Broadchurch original series continues broadcast in Germany on ZDF. Episodes five and six will be shown tonight. 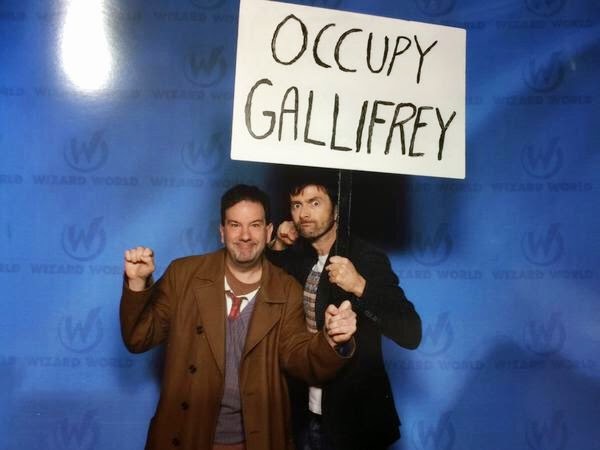 David Tennant attends Wizard World Comic Con in Philadelphia again today. David Tennant Daily News Digest for Saturday 9th May 2015 (9 items). Photos of David Tennant and Billie Piper with fans at Wizard World Comic Con Philadelphia today. Recap of the David Tennant and Billie Piper Wizard World Comic Con Philadelphia panel today. A video of David Tennant saying he loves Billie Piper very deeply has been posted to Tumblr. Photos of David Tennant and Billie Piper at their Wizard World Comic Con Philadelphia panel today. A video of David Tennant and Billie Piper heading on stage at today's panel has been posted to Facebook. Doctor Who starts to air on Disney XD in the US tonight with New Earth. 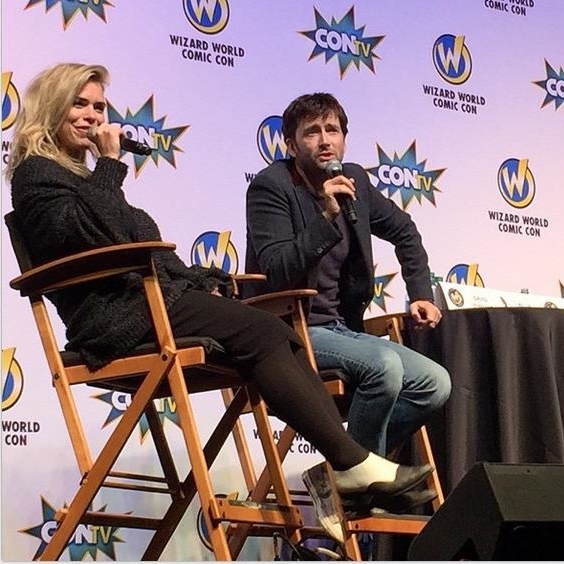 David Tennant and Billie Piper attend Wizard World Comic Con in Philadelphia today. David Tennant Daily News Digest for Friday 8th May 2015 (6 items). ZDF has posted a trailer for Broadchurch Season One episodes 5 and 6 which air in Germany on Sunday. A video of David Tennant and Olivia Colman discussing Broadchurch and getting soaked (from the DVD extras) has been posted to YouTube. Entertainment Weekly has an exclusive video clip of 'The Making Of Broadchurch' from the extras on the DVD. Episode four of the first series of W1A is on BBC Canada tonight. David Tennant Daily News Digest for Thursday 7th May 2015 (7 items). The David Tennant / Billie Piper panel at Wizard World Comic Con Philadelphia on Saturday will be streamed live on the internet. Episode three of the second series of W1A premieres on BBC Two at 10pm tonight. Broadchurch Official Short Story Collection (Series 2) is released on Kindle in the UK today. Doctor Who: Shining Darkness is republished in paperback today in the UK. David Tennant Daily News Digest for Wednesday 6th May 2015 (7 items). A photo of David Tennant with Angel Pai from A.K.A. Jessica Jones has been posted to Instagram. David Tennant has narrated another Labour Party video ahead of the general election tomorrow which has been posted to YouTube. Doctor Who to be shown in India including David Tennant's episodes. Episode six of Gracepoint has its UK premiere on ITV Encore tonight at 10pm. Broadchurch Season Two DVD and Blu-ray is released in France today. David Tennant Daily News Digest for Monday 4th and Tuesday 5th May 2015 (7 items). Broadchurch Season Two DVD is released in North America today. Public booking opens today to see David Tennant in Richard II in London in January. David Tennant Daily News Digest for Sunday 3rd May 2015 (4 items). David Tennant has provided a voiceover for another Labour Party video. Broadchurch original series continues broadcast in Germany on ZDF. Episodes three and four will be shown tonight. David Tennant Daily News Digest for Saturday 2nd May 2015 (4 items). A lovely photo of David Tennant was posted to Twitter from Thursday when he went to see Catherine Tate in The Vote at The Donmar Warehouse. Specialty comic stores around the world give out free comics (including a Titan Doctor Who New Free Adventures With Three Doctors special issue) on Free Comic Book Day today. David Tennant Daily News Digest for Friday 1st May 2015 (6 items). Broadchurch combined Season One and Two are available to pre-order on DVD and Blu-ray in France. The release date is Thursday 15th October. The trailer for Broadchurch Season One episode 3 and 4 (which will be shown on Sunday evening in Germany). Episode three of first series of W1A is on BBC Canada tonight. How To Get Ahead will be broadcast on American Public Television channels from today. David Tennant Daily News Digest for Thursday 30th April 2015 (9 items).